There was no extra time left to warm up here at Alacati. We arrived on the 10th in the night in Izmir, had a cool ride with Finian and his family to the event venue and arrived at the beach for the registration I was used sailing in rough waters and had a very bad start in race 1. After day 1 I was placed on 56. position. While day 2 and 3 I could stabilize my form a bit and advanced to position 38 after 6 races. The condtions are very nice here. 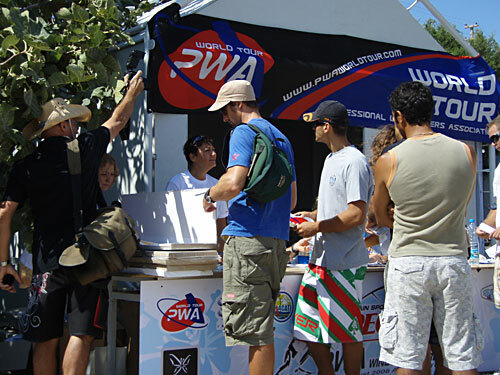 We stay at the Myga Windsurf Club and Kutlu, the turkish organizer, makes a great job. Three days are left and I hope to continue with better results. The speed is quite ok. Most of the races I sailed on 7,7 Code Red and Isonic 122 with the Vector Canfire 44. I will test out the 9,0 today.